The Central Committee of the American Party of Labor has long planned to publish a theoretical journal. Today that plan has finally bore fruit. When a revolutionary organization dies ideologically, it is only a matter of time before it ceases to be truly revolutionary. Such a theoretical journal is entirely necessary for building up a true proletarian movement and a true proletarian party which is national in scale, connected with the working masses and is fully consolidated in organization, in political line and in practice. This necessity is even more closely felt by all our comrades given the present situation—on the one hand, there is the eternal threat of global imperialism, led by US imperialism, and on the other, we have modern revisionism, phony Marxism that acts, at home and abroad, as agents of imperialism. 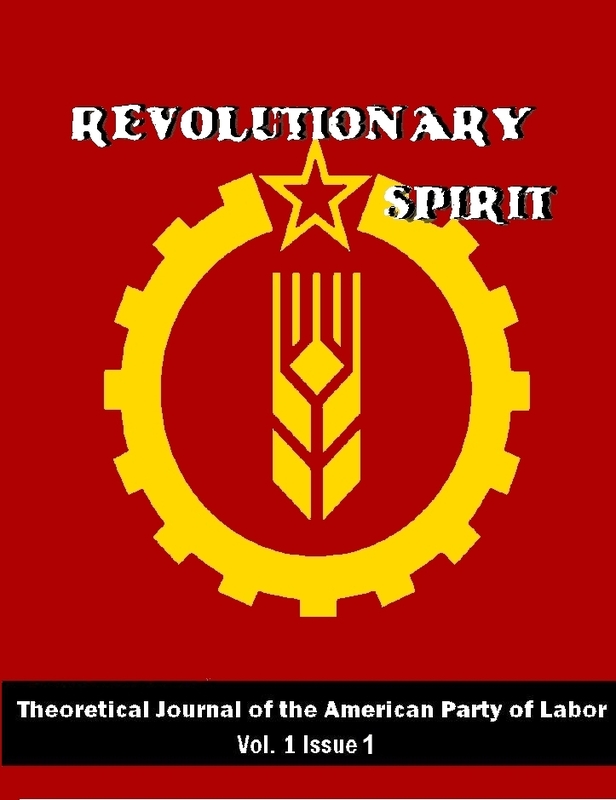 The American Party of Labor’s new theoretical journal is called Revolutionary Spirit. What is its purpose? How will it differ from other left-wing journals of the same type? The building of a thoroughly scientific and Marxist-Leninist party is essential to our task of waging revolution in the United States. For this, we must have a thoroughly scientific theory to guide that party. This is why Revolutionary Spirit is being published at this time. Revolutionary Spirit will be different because it breaks with all phony Marxism and revisionism. We uphold the line of Marx-Engels-Lenin-Stalin, and we label ourselves Marxist-Leninists. This name is not meant to take away from the developments of Engels or Stalin in any way. In fact, the American parties today have thrown the teachings of Lenin and Stalin into the dustbin, whereas we have reclaimed their works as living, breathing texts. Traditionally, stages of developing Marxism are named by adding a suffix of the latest theorist or leader to the name “Marxism.” For example, Lenin was added to Marxism by calling it “Marxism-Leninism.” We are breaking with this tradition of seeking to endlessly add suffixes, like “Marxism-Leninism-Maoism” or “Marxism-Leninism-Stalinism,” since it is unnecessary in many cases, and in most cases it is a sign of a revisionist tendency, such as with Prachanda Path, the Juche Idea and Gonzalo Thought. As well, though we follow the line of Enver Hoxha of Albania in most things, we are not going to explicitly call ourselves “Hoxhaist” or “Marxist-Leninist-Hoxhaists,” since Enver Hoxha’s developments of Marxism are not substantial enough on their own. Hoxha’s famous work Imperialism & the Revolution merely pointed the way for non-revisionists to act. The American nation is plagued on all sides by revisionist organizations watering down and distorting Marxism by putting forward liberal, Trotskyist, anarchist and overall capitalist ideas and trying to fuse those ideas with Leninism. Since the collapse of Albania, there has been no further development of revolutionary theory, or any socialist states. There has sadly been a trend of retrogression internationally. We hold that Marxism-Leninism is the most revolutionary science alive today. What breakthroughs are at the core of Marxism-Leninism? • That the transition from capitalism to socialism requires the revolutionary overthrow of the exploiting classes and the establishment of the dictatorship of the proletariat. • That the transition between capitalism to socialism and from socialism to communism can only be brought about under the dictatorship of the proletariat. • That the dictatorship of the proletariat shall be under the leadership of a vanguard party made of the working class. • That the socialist period must take the form of a centralized state-planned economy to replace profit motive. • That revisionism presents a very real danger to the anti-imperialist and Marxist-Leninist movement internationally, and that all parties should attend to the political education of their members with publications such as this, so that any future revisionism may be eliminated before it sabotages socialism once again. • That the continuing global warfare being waged by the imperialist countries with US imperialism at the head must be opposed, as should all imperialist wars waged against the peoples in developing and colonial countries. • That movements of national liberation that fight imperialist war, occupation and annexation in oppressed nations must be supported. • And finally, that the current world situation reflects the continuation of decaying global capitalism and imperialism, and must be used by the working people to advance the cause of socialist revolution. It is to uphold these principles of Marxism-Leninism that the CC of the American Party of Labor has chosen to begin publishing Revolutionary Spirit at this time.